I have served for the past four years on the Rock Creek Pool board and would appreciate your vote for a third term. Elected by fellow board members as treasurer for the pool, I have been responsible for making sure along with other board members that the pool’s books are in financial order. My wife, Karen, and I and our two sons have been members at Rock Creek for more than 15 years. In my professional career, I have been a journalist and secondary school teacher. At present, I am a freelance editor and writer. Kelly Briscoe has been a member of Rock Creek Pool for 15 years. She lives in the Rosemary Hills area and is a full-time mom of three children: Madison (19), Garrett (16) and Troy Shaffer (10). Kelly and her husband, David Shaffer, have lived in the D.C. area since 1992, but they are originally from Wisconsin. She currently works at The American Society for Cell Biology (ASCB) as a Project Coordinator. Kelly has experience serving on Boards of Directors from her three years as the Marketing Chair for The Spring Knolls Co-op Pre-school. She loves people, animals, cooking, walking in Rock Creek Park, and good music along with a gin & tonic. I have been a financial advisor with SunTrust for 23 years. One focus of my wealth management practice is working with local small to mid-size not for profit organizations. I have extensive experience working with not for profit organization boards, committees, and employees in a collaborative manner to make prudent decisions. These decisions are aimed at improving member experience, advancing the organization’s mission, and generally helping make the entity the best it can be. I have helped organizations with their management structure, governance, investment and other policy creation /adjustment, capital allocation, and reserve management. I currently serve on my church finance committee at the Shrine of the Most Blessed Sacrament in Chevy Chase. I am Vice-Chair of the board of trustees of San Miguel School in Washington DC. I also serve on the Archdiocese of Washington Board of Education. Rock Creek Pool has been important to our family. I feel the pool has a wonderful mission. It fosters a meaningful feeling of community. It enables families to spend traditional quality time together while they meet and enjoy the company of friends and neighbors. Rock Creek Pool is indeed a precious resource. I feel Rock Creek is at an important crossroads in terms of decisions that need to be made, and leadership that needs to be exercised. We have important capital allocation decisions to make, the ramifications of which will be material to our members. Our pool and grounds are enviable. I truly feel we can make Rock Creek Pool one of the finest recreational experiences in the area. I want to be an integral part of that worthy goal. Thanks for the consideration. Now finishing my third term on the Board, I have been a pool member for 14 years, along with my wife Jennifer and children Saige (15), Vance (13), and Kinzly (11). I initially ran for the Board to advance the views and priorities of newer members and families with younger kids — both to improve current pool operations and manage our facility with a longer-term perspective. Six years later, I no longer qualify to represent that “younger family” category … but offer more experience and substantive contributions to initiatives that I want to help see through completion. My emphasis in recent elections was the need for a master planning process to guide future decisions with a comprehensive view of alternatives and budget, rather than ad hoc projects; although it took a while, I co-led initiation, development, and completion of the “modernization” plan and contract. Now transitioning to construction overseen by Board colleagues having that expertise, I want to ensure that our agreed intent is fulfilled for the project, including assurances I personally articulated to Members about design, budget, and minimizing financial burdens. Additionally, over the past several years the Board has made major progress on fundamental issues – administration, member management, and communications systems; access expansion / waitlist reduction; deferred maintenance; social activities. But further work still needs to be done on making physical improvements beyond construction, ensuring professional operations, reviewing membership policies, and balancing dues decisions against spending needs to achieve fiscal responsibility and fairness. So my motivation now is to help deliver the commitments we made in planning and approving modernization, address some of the unresolved issues, and continue our positive momentum. Over the past two years in my first term as a board member, I have worked closely with a number of board committees supporting the pool and grounds. Specifically, I initiated the project to upgrade the tennis court surface and lighting. We now have a much more efficient lighting system with and electronic pass code that sets the lights on a timer, so no more tokens! I am also part of the modernization team with special attention to the pools ADA compliance options. The Nealis family has been active members of the pool since 2008. My wife, Libby and I have three children Drew (15), Connor (12) and Samantha (12). The boys have both been on the swim team since they were eligible and Samantha has made tremendous progress with her mobility at the pool each year. Over the past five summers, I have volunteered in a number of ways for the RC Fins swim team. I have spent many Saturday mornings and Wednesday evenings at meets, helping with set-up and timing. This member community has been very important to my family over the past 9 years and I have enjoyed giving something back by serving on the board. With so much happening in the next few years, I would welcome the opportunity to leverage my experience to continue serving the pool through this important time. I live in Rock Creek Forest with my husband Rick and three kids (Sarah, Jack, and Kate) and have been enjoying Rock Creek Pool membership for about 15 years. During the work day, I direct grants management at the Meyer Foundation, a funder of nonprofits serving low-income communities in our region. In recent years, I served as parent liaison for the design and construction of the new Rock Creek Forest Elementary School and as co-president and secretary of the RCF PTA. Over the years, my family has enjoyed the wide range of fun and toil that the pool offers: volleyball, tennis, swim and dive teams, lifeguarding, masters swim, yoga, stream clean-ups, dancing on the deck, and sledding. I have volunteered in a variety of capacities for swim team but these days you can usually find me as a head timer. I’m interested in increasing member engagement in the life of the pool and helping to make the pool a friendlier place for newcomers. I appreciate board’s hard work to increase transparency and take advantage of technology to improve accountability and efficiency. My husband Michael and I have been walking across Grubb Road from May to September to swim, play tennis and enjoy friends and neighbors for 13 years now (7 as summer members and 6 as full members). My dog Nico and I walk on the property every day – rain or shine, all year long. Our children, Melanie, Stephanie and Zoe, are teenagers and enjoy the pool facilities with their friends. I have been the Secretary of the Board of Directors of the pool for the last four years. I’m an active pool member and try to help wherever I can. For example, I helped out with the Memorial and 4th of July BBQs. I have assisted at the table for dive meets, helped run social events and volunteered at swim meets for many years. I appreciate the hard work that goes into running these events and have some ideas to help new families get involved. About 16 years ago, I was interested in helping new parents make connections and founded DC Urban Moms (an online parent connection community). As a board member, I would continue to represent members who enjoy the pool in the summer as well as the rest of the year (our home is around the corner from the pool grounds). 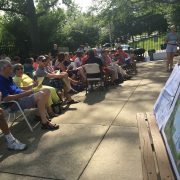 I want to continue to preserve the RC Pool community that serves both our families as well as the Rock Creek Forest neighborhood. 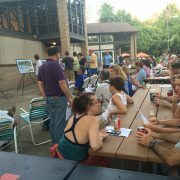 Full members will vote at the Annual Membership Meeting on Labor Day (Monday, Sept. 4 at 4pm) to fill seven seats on the Rock Creek Pool Board of Directors. If you are a full member (not August or Summer) and are interested in running for the Board, please email Michael Abate (michaeljabate@gmail.com). In your email, provide a short bio explaining who you are and why you would like to be on the board. This bio will be shared with the voters prior to the election. The deadline to enter your name for consideration is Sunday, August 27.